"You rode great today, just fabulous!" My riding instructor Leana said. Leana grinned. "You bet!" She said. I looked at my pony and hugged him. "You're mine now boy... all mine." I murmured into his soft glossy coat. That was two years ago but a week ago tragedy struck. "Carrie that horse of yours is taking up an awful amount of money," said my father Bill after dinner, he was just teasing though, he always teased. Though through out the night I realised maybe he wasn't teasing. I lay awake in bed, it was about 11 because I heard my father going to bed. I couldn't get back to sleep but I didn't want to because I kept having the same dream. It was about giving my pony back. I ran and ran and ran. "Faster!" All the mares were calling to their foals apart from mine, the humans were attacking once again! I knew why she had not called for me. She had gotten away from the humans and onto a high ridge without the humans noticing and if she called for me the humans might spot her and catch her. It must have been a hard decision for her to leave me. I know she is very fond of me but I can't think of happy families now I have to go I have to get onto the ridge. I had a plan it would be risky but I had no choice, I couldn't keep running forever, I'm just a foal and I don't have as much energy as the other horses. I carefully slowed down and stopped. Most of the horses just dodged me not caring if I got caught but a few of the mares stopped and tried to move me but it was no use I wouldn't budge so they were forced to gallop ahead. Now was my chance. I surged forward and made the horses go near the trees surrounding the ridge. I saw a gap between the horses. if I did go through and the horses went faster, the gap would disappear and I would be trampled. But I decided I would do it. I did a huge rear and galloped through to the trees. sorry there is so many, my computer was slow and i didn't know if it had posted the comment. Off I go to read them! :) I will share your story with my friends! Thanks again. Have you written more? Can you comment me a link to it if you have more? Don't leave me in suspense! I woke up with a fright. I looked at my bedside clock it was ten already! I raced into my dad's bedroom to ask him if he meant what he said but he wasn't in there, hmm how odd I thought. I decided to see my pony so I washed and dressed and raced out the front door. I went to the garage and got my bike and pedaled as fast as I could to the local stables paddocks. The paddocks were about 6 kilometers long so you had to take a car to get to the actual stables. When I got there I saw my instructor leading a horse into a navy colored horse truck. The horse was a bay with three white stockings. It was my horse as soon as he saw her. He reared up thrashing out at my riding instructor "wow!" she said and dropped the lead rope. He started galloping towards me I kept perfectly still though I knew he wouldn't dream of trampling me. He stooped right in front of me and nickered "hey boy," I said tears coming to my eyes I knew there was a reason he was being floated, I knew the reason. I hugged him tears were coming down my face like a waterfall, "boy she's taking you away but you're mine and you must always remember I love you this isn't my fault I don't want this to happen anymore then you do boy." I said I suddenly had a crazy idea. I looked at the horse standing beside me. I quickly tied the lead rope to the other side of his halter like reins then I mounted up. "Run." I whispered, he burst forward in a gallop. I broke out of my sleep I saw a dapple grey horse next to me "where... wheres mum?" I asked the horse, "she's safe but you weren't" said the horse it had a deep and noble voice I guessed it was a stallion. In a high pitched voice "I'm Cisco," he replied. "Oh, I'm Boaz," I said. Cisco looked at me curiously, "and how old are you Boaz?" He asked. "I'm six months old," I said proudly. "Well at least you don't really need your mother's milk from now on," my face fell. "But it's sweet," I whined. "Silence, you shall eat grass now" He said starting to graze. "The grass from our herd land didn't taste very good and I doubt this stuff tastes good either," I said. "Young one you are very wrong, this grass is better then any grass. We have the exact location where the sun shines brightly one day and rain rains another so this grass is very green," he said. I sighed and took a small bite I squealed and jumped backwards. "What is it?" Asked Cisco. I started whining a lot, "something pinched me." I said. Cisco sighed, "you got stung by something probably by a bee or a wasp, look come dip your nose into this cold water," he herded me over to a small pool of water it went around me and Cisco in a circular motion like a miniature river. Though it was so clear it looked like he hadn't drunk from it, there were two other pools like this one, they surrounded us though they were a lot bigger and one led to a big lake. "What is this pool for?" I asked pointing my hoof to the one he was herding me to. "There are a lot of flowers which attract bees and wasps and I get stung a lot but this pool is the coolest and I dip my muzzle in and I feel much better," he explains. So I dip my muzzle in and like he said I feel a lot better. I nodded at him then started grazing carefully dodging the bees and wasps, "this grass is good." I said. Cisco nods then continues his grazing. I start racing around withing the herd could see this place it was a very hot day and the big lake had a waterfall. Cisco was obviously very hot just like me so he galloped towards the lake, surely he won't I thought but then he leaped and fell in. I nervously walked over to the edge of the lake, "what can't swim?" he asked laughing. I reared up and threw my head back. "Yes!" I said and galloped away. I could hear him getting out of the lake and trotting after me. I wasn't very fast but I did have the energy of a wild horse fully grown being unconscious for a night and half a day. I wasn't a good swimmer at all but I was a very good climber and climbed up a tree though when I looked down at Cisco I felt as if I hadn't been doing this for six months. I felt as I only just started. I was scared Cisco was looking around for me as he didn't know horses could climb let alone a young foal. wow Cisco looks really scared now maybe I should go down I thought so I tried to get down but I couldn't "Cisco" I said he looked up "how did you get up there? nether mind slide down my back" he said and reared up so I carefully slid down his back he came down and hugged me "lets get back to the Cisco lands" he said I looked at him "where we were before you ran off" he said "oh"
this is an awsome story. i've already read part 3, but i guess this is okay! this story is awesome! please read this story and comment. "Where...where am I?" I ask getting up. I scream as I see I'm in a forest. I turn as if to see Apollo but he's not there. "APOLLO!" Apollo trots out of the trees. "Oh boy, I though I had lost you," I say. I hear my father calling out, "DAD!" I shout. Apollo trots over to me and picks me up by my shirt. "Whoa boy, put me down!!! We don't want to go back or you'll get sold," I said but Apollo had other Ideas. He started galloping towards the sound of dad's voice. "No boy!" After that my dad grounded me and Apollo got sold. Today I'm going to see Apollo for the first time since he was sold. We're going trekking into the forest but there's a live camera on my hard hat so I can't try and run away again. I arrive and Apollo's already tacked up. "Thanks," I say and mount up. I aim him to go into the forest so I kick him and cluck him on. "Let's go boy," I said to Apollo as we trotted through the forest. 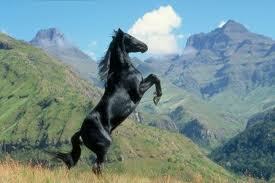 "Oh my," I said as I saw a black stallion. His nostrils were flared as he reared up to fight me but then he realized I was no threat and he stopped rearing and returned to the ground. "Good pony, you're so pretty." I told him. "I'm a horse not a pony. I'm not pretty, I'm a stallion and I prefer to be called handsome." He said. My mouth was wide open. "You, talk????" I asked him. "You understand me?" He asked. i'll write part 4 now. hi! i love this story! i totally think you should write part 4! woah, THAT was an unexpected twist, but a good one!! part 4, plz!!!!!! I trotted to the stables on Apollo and walked home. I heard glass smash. "Dad?" I asked. Suddenly running in was a man wearing complete black was standing in the lounge. "What do we have here? Ah? A little girly, well we'll see about that," he said walking over to me. My eyes widened as a horse-like shape came through the window. "What?.... Ahhh!" Said the man backing away. "Apollo?" I turned on the light, "Boaz!" I said. Sure enough the black horse was standing there on his hind legs thrashing out his front legs at the man and the man ran away. "Thanks Boaz," I said when the man had gone. "You're welcome, I'm just glad your safe, but I have to go now. My dad will be wondering where I am," he replied looking into the trees. "Visit me," I told him. He nodded and jumped back out the window and into the trees. "Boaz!" I heard Cisco shout. "There you are now. Find a mare so that you can have a foal, a great foal," he said. thanks for the great comments.. part 5 is out!!! that was great thanks for that!!!!! i've been waiting for this for months! I really loved it. i'm a twin who lives in oregon. my sister is tired of me talking about nothing but horses. My dad just lost his job. it is a hard time for us now. mom and dad are yelling at each other. it's hard to get to sleep at night. your story and all the other horse-crazy girls are inspiring me to keep up my dream of owning a horse. i hope you write more. I ate the sweet grass that grew around the lake. In front of me Cisco was eating some dandelion leaves and everything was peaceful and quiet apart from the hum of the bees and the birds singing their happy songs 'til they heard yaw yaws and horse hoof beats. The birds flew away quickly and the bees fled just as fast. Boaz and Cisco put their heads up to see what was going on. "No, no it can't be," said Cisco. Boaz gave him a puzzled look til he saw two humans on horseback with lassos attached to there harsh western tack. "Run Boaz! RUN!" So I galloped as fast as I could but the other two horse where fast too. Cisco ran on ahead urging me faster. "Yaw yaw!" One shouted and and threw the lasso. It was on me! I panicked and tried to run with them still holding on but there was no use. I eventually gave up and lay down. They got me up again though and led me away. I walked upstairs to my room after a long day of school. "Carrie is that you? I booked you a riding lesson on Saturday." I heard my father call. "OK dad, thanks." I called. I got led in a stall I was at a stables I got put into a stall with a chestnut horse. "Apollo?" I asked as I recognised him. :[. But basically what was gonna happen was Apollo is Boaz's brother. are you still going to write more?